Bringing a global movement to reimagine governance to Los Angeles. IFTF approached verynice to bring their governance futures lab to the city of Los Angeles in the form of a day long “civic hackathon.” Across the globe, in several key cities, different events were being hosted, and verynice was selected to be the Los Angeles home base. The goal of the workshop, as briefed by IFTF, was to re-imagine the future of governance. To start, we recruited 10 individuals from around LA that work within a very diverse array of field including: engineering, game design, design research, public policy, and business management. Our decision to curate a pool of participants like this was intentional as our desire was to engineer a space for serendipity that could result in interesting collaboration and cross-disciplinary work. We opened the session by showing examples from our research into cutting-edge models for governance from around the world as well as a basic introduction to futuring methodologies and prototyping techniques. Each of these ideas served as inspiration throughout the day, but also were a strong basis for getting the participants thinking quickly about these topics in the governance space. The workshop format for the rest of the day leveraged a unique facilitation methodology that we developed especially for this event. For the first 5 hours of the workshop, we led participants through a total of 10 30 minute “sprints” that worked as follows: 30 minutes to work alone on your project, 30 minutes to share your concepts with others and gather feedback, 30 minutes to work alone on your project and implement the feedback from your peers, 30 minutes to share your concepts with others and gather feedback… and so on. The practical concept behind this format was to design an environment for our participants that could results in serendipity, but also a format that allows for each participant to explore their own interests while still subjecting their ideas to the opinions of their peers in order to create prototypes with more depth and rigor. On a more philosophical level, this facilitation format also speaks to a vision for the future of governance in which there is a blend of capitalistic opportunity with socialist ideologies and “collective intelligence.” In lieu of that, all of the pieces that were created during the workshop share equal authorship amongst each participant. When thinking about governance, it is easy to get caught up in the bureaucracy that plaques the space. Because of that reality, innovation is scarce in this space, and progress can be quite slow. However, when your context is 50 years into the future, and your restrictions are very small, very interesting ideas can result. Even though many of the concepts produced during the course of the workshop are not immediately feasible (and possibly will never be feasible), they contribute to a kind of conversation that points toward a bespoke future for governance. One that we may actually like to inhabit. In the future, designers will be able to collaborate with community members in social media based “public comments” to improve the development of communities. First, community members use interactive maps to find local community development projects. Second, these community members use social media tools to identify design elements they want to incorporate. Lastly, they “pin” the projects / concepts for other community members to review. Often the news that reaches us is curated by our personal network and by a few big media corporations that determine the type of news coverage. We often handpick what we choose to read and may miss out on many critical perspectives. 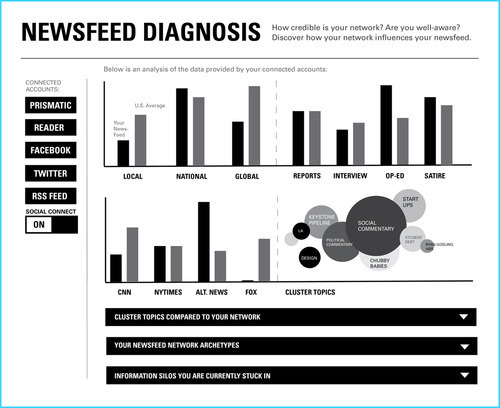 Newsfeed Diagnosis provides a holistic/global context to our personal and network consumption of the news by connecting our major newsfeed streams, the platform provides analysis on where our news stands on the global scale, the diversity of perspectives, information silos, and comparisons to our network. Apps like Foursquare are used to check-in to places that exist. What if we could instead use an app to project our interests on places that we wished existed? 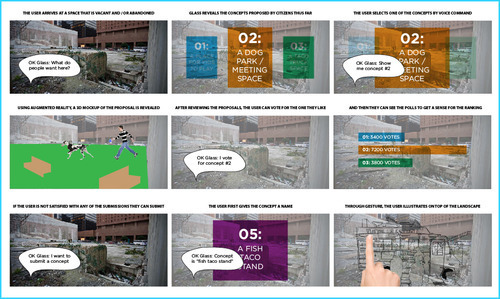 Using this framework, this proposal imagines the use of google glass to leverage augmented reality to allow citizens in a community to collectively preview, submit, and vote, for a concept to be implemented in vacant spaces around their local city. Today, the growing prevalence of smart devices from google glass to the internet of things highlights the ability to track, analyze, and synthesize real-time user data. This proposal imagines how we might see the development of responsive urban governance of social spaces by 2063. 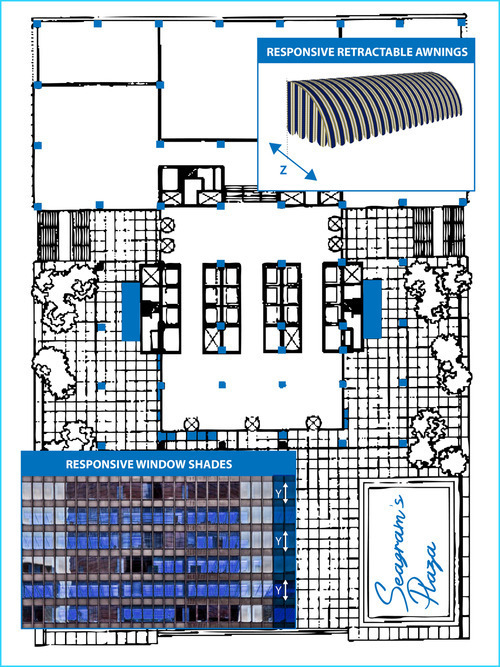 With the installation of “intelligence” throughout Seagram’s plaza, social patterns could be locally and dynamically crowdsourced rather than translated by a third party, with hopes for informing future stages of re-development. Special thanks to The HUB LA for sponsoring the project and allowing us to use their beautiful space for the workshop experience! A social media campaign to end epilepsy and celebrate a unique community. Embedding business-model design into a social enterprise incubator. Bringing the bay to your screen through user experience and new media. verynice is one word, all lowercase, with no period and no capitalization, if you were wondering. Check out current opportunities.